Disclosure: Lisa Mantchev is a friend and I’ve been reading drafts of this book since before she found it’s name. Also, I freelance as her sidekick and occasional ninja. Yes, I am bragging. She’s worth bragging about. 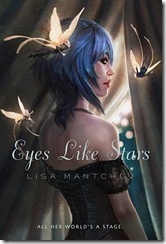 In Eyes Like Stars, Lisa Mantchev tells a simple story, about a found orphan struggling to save her home. Except that Bertie’s home is a theater. And not just a theater, but *the* theatre, where all the characters of all the works of all humanity make their home. She’s grown up amidst pirates, magicians, brigands and elementals. Her best friends in the world are fairies. The stage sets are doorways that let her live and play anywhere and anywhen she wishes to go. But now she’s going to lose it all. Unless she can find a way to keep it. And all of that? That’s chapter one. As I’ve mentioned, I’ve read a few versions of this book, a few times. And despite the repetition, I still get sucked into the book and have trouble putting it down. It’s funny (though with the fairies sugar-fixated intensity that may have been inevitable). It’s well written, with great imagery, and the pace is relentless, but leaving me feeling that I’m being force-fed. And the biggest win, to me, is that this is a book with fantastic characters. And the villains of the piece are realized characters too. It’s a point of personal frustration to read fabulous stories with bad guys who exist for the sole purpose of opposing the Heroine, and that extra bit of depth really gave the story that something that makes me want to reread it. Of course, that won’t be what you remember about the book. You’ll remember the fairies. You’ll remember Bertie. You’ll remember the headlong rush as she throws everything she is and has at trying to save her one place in the world. And you’ll laugh. It’s a fun, funny book. Then you’ll scowl. Because you’ll be at the end of the book, a good non-cliffhanger end. The problem is that it’s an good end to a good book, but not the end of the story. Which means that you’ll be stuck, like me, waiting for the next book to find out what Bertie does next. And because it’s funny that it’s been exactly two years, here’s the blurb that I gave Lisa when this process was just getting started: A bold, genre-busting tale of derring-do, of pathos, of bitter conflict, and lasting friendships, Lisa Mantchev’s ScrimshawEyes Like Stars is a brilliantly executed tour-de-force, a rousing romp, where all the world’s the stage, and only the players can save it. It’s a good book. I recommend it without hesitation. You can preorder it from various places at the book’s website, at theatre-illuminata.com. In fact, there’s a contest running for free advance review copies, so go check it out. 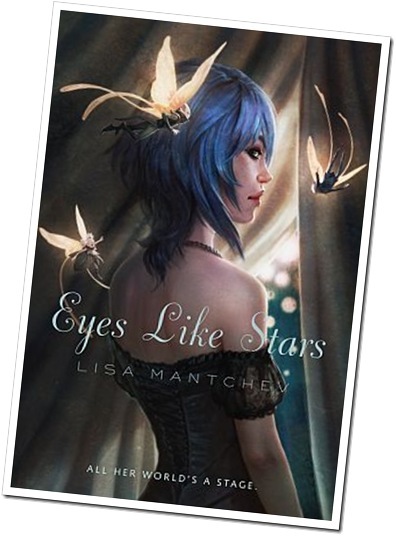 Tagged with fantasy, lisa mantchev, reviews, writing, young adult. Very cool! I can exploit my kitty. woot! the book sounds like great fun. Sunil!! Lisa tells me such good things about you!